Are German cemeteries dying out? Gravesites used to be status symbols, elaborately designed and painstakingly maintained. But today cremations and burials in nature are increasingly popular. Will this trend be a problem for cemeteries? "The dearest place on this earth, for me, is the patch of grass beside my parents' grave." So goes a 19th-century German dirge describing a family's last resting place. In times of globalization, however, people tend to be more mobile and families often live far apart, making it difficult to tend to a family gravesite. In addition, a traditional burial and years of maintenance of a grave are costly. As a result, more than one out of two people in Germany these days opt for cremation and an urn burial. In several EU countries as well as the US, families can take home the cremated remains of their loved ones. While many Germans might prefer that choice as well, it is forbidden in Germany. According to German burial law, the remains must be buried in a cemetery or a specially designated area. Many funeral homes also offer burials in nature, but these often then take place in other countries. Cremated remains in urns can be buried in forests, or the ashes can be scattered at sea. Both are popular, as is scattering the ashes in mixed fruit orchards. The FriedWald cemetery outside Berlin offers tree gravesites. Switzerland allows for scattering ashes or burying urns on mountain pastures, among craggy rocks and in rivers. In the FriedWald cemetery, ashes are planted at a tree's roots and a plaque commemorates the deceased. Are cemeteries going out of business? "About a third of the cemeteries in Germany won't continue to exist in their present form five to ten years from now," says Judith Könsgen of the German Cemetery Association. Urns only take up about one tenth of the space required for a casket. As a result, almost all cemeteries have swathes of unused ground surfaces. They suffer from a slump in earnings despite a steep rise in burial fees, Könsgen says, adding that city administrations are not allowed to cross-subsidize cemeteries with funds from other sources. At the same time, cemeteries' fixed costs remain high. But Michael Albrecht of the Association of German Cemetery Administrators says that while there are no statistics at the federal level, he hasn't heard of a single cemetery forced to shut its gates over the past years. Until about 2040, Albrecht expects there will be more than 1.2 million deaths per year in Germany. With interment periods of 15 to 30 years, change is slow to come to cemeteries anyway, he adds. Bonn law professor Tade Spranger urges German cemetery administrations to be more flexible, arguing that much is forbidden, for instance "planting certain plants on graves or placing toys on children's graves." And some cemeteries don't allow burials on Saturdays, even though relatives might live far away and need the full weekend to travel to a burial. "If they're not flexible, the administrations will find they are digging their own graves," Spranger says. Some towns are also trying to be more flexible when it comes to environmentally friendly burials. Planegg, a town southwest of Munich, is mulling suggestions by an expert to plant a mixed fruit orchard on its premises and to offer tree and meadow interment. People are increasingly concerned about the ecological compatibility of burials, and many are opting for urns made of materials that easily decompose, such as felt or wood. In its Green Line range of products, Hebenstreit & Kentrup, a funeral home in Bonn, offers headstones and plaques crafted of local stones, seasonal flower decorations and memorial cards made of uncoated paper. These containers made by Capsula Mundi are an example of green burial practices. Each seed-like pod holds the body of the deceased, and a tree is then planted on top. Increasingly, city planners see cemeteries as natural spaces where both flora and fauna can develop in a protected environment. Cemeteries are a "quiet alternative to highly frequented public parks," a study by the German Federal Environmental Foundation (DBU) found three years ago. According to the survey, visitors use the space to read, walk or sit in the sun. Such graveyard leisure activities are more common in cemeteries that "abut to residential neighborhoods and are easy to reach on foot." DBU project manager Martin Venne says that is a great opportunity for cities and municipalities. Three out of four of the cemetery administrations interviewed for the foundation's survey said they have already put in place measures to help sustain biodiversity, for instance by installing nesting aids for birds. Cemeteries may be eternal resting places, but it seems the places themselves are evolving. When celebrating the lives of their dearly departed, Germans aren't afraid to go big for all eternity. Here, a family enshrines its members at the Stahnsdorf cemetery in Leipzig. With the help of a formidable metal door, living relatives dissuade any would-be plunderers. Romans who made it to the west side of the Rhine River weren't embarrassed about a post-mortem splurge, either. Cologne sports the best preserved Roman sepulcher anywhere north of the Alps... even if it does happen to lie incongruously between two homes on the busy Aachener Strasse. Roman culture added headstones and sepulchers to pagan German practices of cremation and burial with shrines. ...burial within a chapel was reserved for the spiritually well-connected. German cathedrals and churches are filled with the reposed forms of deceased priests, bishops and archbishops - but also the dukes, princes and kings who protected and promoted the Church's work. St. Mary's, pictured here, was the seat of the Prince-Bishopric of Würzburg in Bavaria for nearly ten centuries. This tragic burial place is important for what's not pictured: Before this nine-year-old lost his battle to cancer in 2011, the dedicated Borussia Dortmund soccer club fan made it clear he wanted a soccer ball carved into his tombstone. The Catholic cemetery refused; the headstone wouldn't have contained a Christian cross. When public outcry ensued, the cemetery changed its mind. Not all German cemeteries have such rigid rules and the Catholic Church does not have a say on all graveyards. In Essen, a non-denominational cemetery - one of 60 throughout Germany - welcomes any and all to be buried there and Bosnians and Turks are resting in peace side by side. Centuries of gravestone tradition haven't stopped Germans from fully embracing the modern. But before you assume that's a cell phone - or "Handy" as Germans refer to them - look closer: this woman passed away in the year 2000. She was likely a fan of the more traditional telephone, itself on a slow march to the graveyard. There’s even a tombstone for the Deutsche Mark, Germany’s former currency, which was alive from 1948 (in West Germany), or 1990 (in reunified Germany) until 2002, when the euro took over. But as real as the "death" of Deutsche Mark was for some Germans, the grave with its tombstone isn’t real and rather an advertisement for a small headstone company in North Berlin. 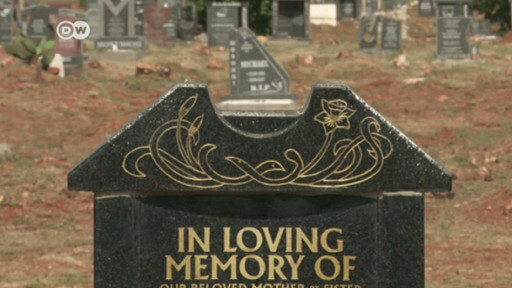 Johannesburg in South Africa is running out of space to bury its dead. A growing population has put huge pressure on land in the city. So now, Johannesburg officials are having to think more creatively about what to do with the dead. The funeral of father-and-son victims of the New Zealand mosque massacre has taken place. Authorities spent four days constructing a special grave at a Christchurch cemetery designated for Muslim burials.